For economic data geeks, Friday's U.S. jobs report is the last big event of the year. 1. Jobs and wages: The November jobs report is due out at 8:30 a.m. ET. 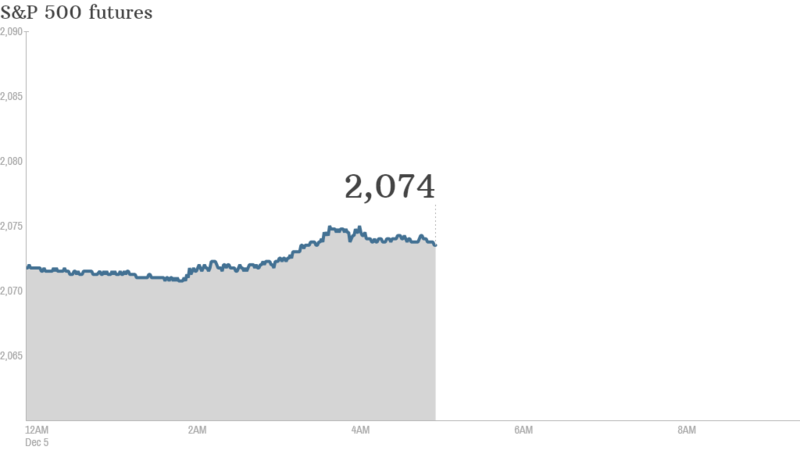 The consensus forecast from economists surveyed by CNNMoney is for a gain of 228,000 jobs. That would be up from the 214,000 jobs added in October, when the unemployment rate fell to 5.8%. The U.S. economy is on track to record its best year for job growth since 1999, but wages are still struggling once inflation is taken into account. 2. Europe bounces back: European markets recovered from the disappointment of Thursday's inaction by the European Central Bank, helped by news of surprisingly strong German industrial orders in October and in anticipation of healthy U.S. jobs data. Germany's DAX was up 1.3% in morning trade, and other major regional indexes posted similar gains. Asian markets had a mixed session. U.S. stock futures were narrowly firmer. 3. Market recap: U.S. stocks closed slightly lower Thursday. The Dow gave back 12 points, while the S&P 500 and Nasdaq both slid about 0.1%. 4. Stock market movers -- GAP: Shares in Gap (GPS) gained 3.4% in after-hours trade, boosted by a 6% increase in net sales in November. Its Old Navy brand performed well, the company said. Big Lots (BIG) will report quarterly earnings before the opening bell.